Bangladesh is located in South Asia and it is bordered by India, Burma and the Bay of Bengal. 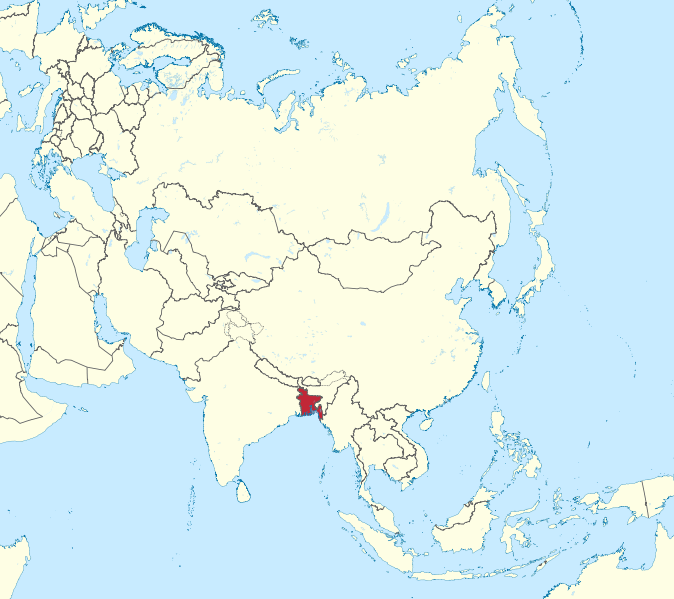 The capital (and largest city) is Dhaka. If you ever wanted to experience the living reality of the idiom 'when it rains, it pours', Bangladesh is the place to be. During the yearly south Asian monsoon, almost all the water collected by the Himalayas in Nepal, north/northeast India and Bhutan transits through Bangladesh on its journey to the Bay of Bengal, depositing life-giving minerals to the soil all along the Ganges Delta, the largest river delta in the world. 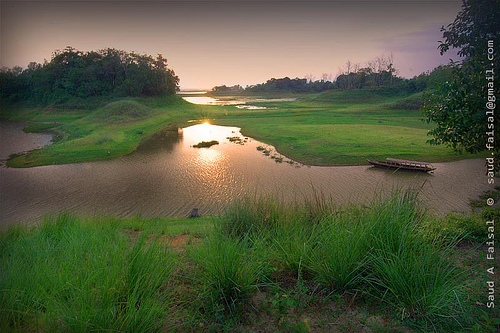 While most of the country lies at or just above sea level, the flat landscape gives way to low undulating hills in the Chittagong Hill Tracts and the hilly regions of Sylhet, some of which climb to 1,000 m above sea level. Visits to this area offer an experience of the true diversity that Bangladesh possesses, both geographically and culturally. In terms of forest cover, Bangladesh's natural places are sadly few and far between. While the world's largest mangrove forest at Sundarban remains protected, many of Bangladesh's other national parks have not fared so well. Thankfully, with increasing stability and economic development, conservation programmes are finally starting to get off the ground. Finally, the region's last major significant geographical feature is a massive 120 krn-long strip of beach lining tile internal eastern coastline of Bangladesh, said to be the longest natural beach in the world. Starting at Cox's Bazaar, the white sand stretches all the way down to the Teknaf Peninsula, poking up again briefly at the coral reef island of St Martin's. 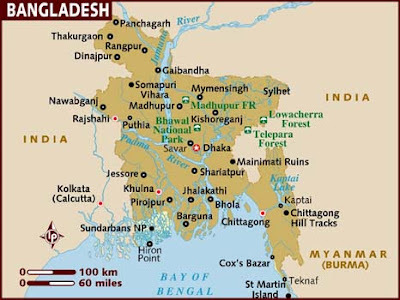 Bangladesh is one of the most thickly populated countries of the world having 768 persons per km2. Natural calamities like floods, locally originated tornadoes and cyclones are regular features affecting the population and habitats in the rural areas. Overpopulation has severely strained Bangladesh's limited natural resources. Nearly all arable land is already cultivated and forestland has been greatly reduced by agricultural expansion, leading to soil degradation and erosion. High growth of population puts pressure on the plants and trees in the rural areas particularly to meet their requirement of fuel substitute for cooking, in brick fields and other small industries. Increasing need of wood for the population for transports, roads, bridges and homesteads add to the degradation of environment. Furthermore, many people are landless and forced to live on and cultivate flood-prone land. Water supply is also a major problem because of population size, lack of purification procedures, and the spread of untreated contaminants into the usable water supply by flood waters. To ease these problems, the government has established drainage, irrigation, and flood protection systems, and has drilled thousands of tube wells to supply safe drinking water in villages. As of 2001, safe water was available to 100% of the population. However, waterborne diseases are prevalent in surface water and water is polluted, especially in fishing areas, from the use of commercial pesticides. There have been also cases when ground water was contaminated by naturally occurring arsenic. The recent growth of garment industries with its backward linkage sectors composite textile mills and leather processing units use substantial quantities of highly toxic wastes, dyes and chemicals. Some of these industries are situated close to the river having access for the disposal of their toxic wastes. Some government owned large industries are creating more pollution problem by their gaseous emission and untreated effluent discharge to the adjoining rivers threatening the aquatic animals and human lives as rural people and animals drink this water for their livelihood. It is estimated that about one-fifth of the total burden of disease in Bangladesh may be associated with environmental factors. Indoor air pollution has been identified as a serious health hazard. In mega city Dhaka most of the poor lack access to clean water and adequate sanitation facilities, and many live in squalid conditions next to extremely polluted water bodies. The triple threat of contamination of the air, land and water has put the capital under stress. The inland capture fisheries, a valuable resource for the poor, have come under threat due to encroachment and degradation of natural assets and rapid urbanization. 95% of Bangladesh’s natural forests and 50% of its freshwater wetlands are lost or degraded. Bangladesh now has among the smallest areas of protected and intact forest in the world, consisting of 1.4% of its landmass. Many terrestrial wildlife species have been lost during the last 100 years. In addition, the International Union for Conservation of Nature in 2000 classified 40% of Bangladesh’s freshwater fish species as threatened with national extinction. Only 0.7% of the country's total land area is protected. In 2001, 18 species of mammals, 30 species of birds and 18 plant species were considered endangered, including the Asian elephant, pygmy hog, Sumatran rhinoceros, Bengal tiger, estuarine crocodile, gavial, and river terrapin. Bangladesh is likely to be among the countries that are worst affected by climate change. The probable impacts of global climate change, particularly sea-level rise and the associated impact on ecosystems and economic loss, adds to the already daunting array of environmental issues. Expected climate change impacts include: increasingly frequent and severe tropical cyclones; melting of the Himalayan glaciers; and warmer and more humid weather. By 2050, 70 million people could be affected annually by floods; 8 million by drought; up to 8% of the low-lying lands may become permanently inundated. In addition to direct inundation of a large population, the sea level rise will certainly result in increased frequency and severity of flooding along the major estuarine rivers. Saltwater intrusion problems will also be exacerbated in coastal aquifers. In spite of a clientelistic, kinship-based social setting, there is a vibrancy of social organizations most of which may be considered as civil society organizations from a broad definition. These organizations are mainly local based and welfare oriented. Government policies and laws also provide necessary legal framework for NGOs and other social welfare groups to register and function easily. Bangladesh ranks among the top Asian countries in terms of intensity of NGO activities. CSOs developed at the community level are mostly concerned with the local problems of the area. In developing countries poverty is one of the biggest problems; naturally most organizations are concerned on welfare and economic empowerment. Financial assurance from donors, lead to more civil society organization and better nongovernmental services which is ultimately thought to bring better citizenry and more participation in political decision making. Such participation related goals often remain unrealized. In case of Bangladesh too, large number of civil society organizations active at local and meso levels is mostly concerned with social welfare and poverty alleviation. Majority of CSOs are engaged in service related functions than advocacy and other participation related matters. In spite of its vibrant nature, civil society is mobilized at a very low rate towards political and democracy related matters. Group based credit activities and large size of social welfare organizations; clubs etc. in Bangladesh indicates the rich abundance of social capital generated through horizontal membership. Moreover, there are numerous registered and unregistered regional groups and clubs. At all social levels and classes among different sections of the civil society the tendency to form a group or small organization is very common in Bangladesh. CSOs working at the national level and NGOs receiving foreign-assistance may be well equipped with handsome budgets and skilled employees; but it is the small local groups, not receiving foreign assistance that are rich in spirited volunteers. From the point of view of international acknowledgment of the performance of NGOs and statistics of large number of different social organizations as well as comparison with other countries, emerges a rather vibrant image of the civil society in Bangladesh. Conversely, performance of the civil society from the aspects of politics and democracy is rather insignificant. CSOs concentrate their policy interest mainly on a set of overlapping policies like poverty alleviation (72%), social welfare (59%), rural development (59%), health care (25%), and education (47%) that is mostly related to their service providing projects. But other important policies that also relate to development but require advocacies and more negotiation with the authorities, attract the CSOs relatively on a low scale: environment (8%), human rights (19%), law and order (6%), labor policy (6%), consumer protection (5%) etc. Experience in Bangladesh shows regulatory instruments are not functioning as expected, because of lack of effective enforcement, for many different reasons. But economic instruments - fiscal or financial - are more effective. State Minister for Environment and Forests has said the government seriously plans to revise the existing taxation laws to levy more taxes on those who will add excessive carbon to the air, and pollute environment. The Government of Bangladesh formulated an Environment Policy in 1992, whose objectives are to maintain ecological balance and overall development through protection and improvement of the environment; protect the country against natural disasters; identify and regulate activities which pollute and degrade the environment; ensure environmentally sound development in all sectors; ensure sustainable, long term and environmentally sound use of all national resources; and actively remain associated with all international environmental initiatives to the maximum possible extent. The Government of Bangladesh has also adopted a number of supplementary policies where environment and development issues have been addressed. Important policy documents in this respect are the Forest Policy (1994), the Fisheries Policy (1998), the Water Policy (1998), the New Agriculture Extension Policy (1995), The Energy Policy (1995). Besides these sectoral policies, the National Conservation Strategy (NCS) and especially the National Environment Management Action Plan, 1995 (NEMAP) have been formulated to provide action plans to respond to environmental issues and promote sustainable development. The second Poverty Reduction Strategy has recognized environmental degradation as one of the most crucial factors that causes and perpetuates poverty in Bangladesh. The PRSP also asserted the need for a comprehensive strategic approach to address environmental challenges and issues. Although some of these policies are not judicially enforceable according to the Constitution of Bangladesh, they are still potentially important in guiding and influencing the activities of the concerned Ministries and other governmental agencies. However, the majority of environmental laws in Bangladesh were passed under substantially different population and development conditions. For example, the Factories Act of 1965 and some other health protection laws were designed before industrial pollution and hazardous substances became serious concerns. The Environment Policy of 1992 of Bangladesh has recognized the need for a better and comprehensive approach to address environmental issues. Very few of the elements of the Environment Policy, however, are yet to be translated into laws. The only legislation which specifically deals with environment issues is the Bangladesh Environment Conservation Act (ECA) 1995. The Act was passed for conservation and improvement of environmental standards and for controlling and mitigating environmental pollution. It however, provides very few substantive obligations relating to environmental management of industries. Industries and projects would require environmental clearance from the Department of the Environment, and any person affected or likely to be affected by such activities can apply to the Director General seeking remedy of environmental pollution or degradation. The major limitations of the Act are its silences on the standards, parameters, emission levels and management elements based on which the environmental clearance should have been applied and obtained. The Environmental Conservation Rules, 1997, were promulgated in furtherance of the objectives of the ECA, 1995. Regarding management of toxic and hazardous substances, the Rules have broadly defined guidelines for disposal of waste from different categories of industries. But unlike the Environmental Protection Rules of India, they have not specified the permissible extent of emissions or the obligations of corrective actions. The highest cooperation between civil society organizations is with the local government, as most of the CSOs are active at the local level and they have high interaction with local governments, which are in charge of the administrative affairs of these small groups and cooperatives. However, the next in line when it comes to cooperation are Welfare Organizations, NGOs, Agricultural Organization and Consumer Organization, all of them social actors. Another noteworthy feature is that the market actors have hardly any cooperation with the CSOs which reflects the low contribution from private enterprises to civil society groups. Corporate giving is not yet a common practice in Bangladesh, though they may consider it as an implicit responsibility. In a research study it has been claimed that big business houses give more to political organizations than to social organizations and small houses give more to community organizations as ‘protection’ money.